Looking for a great bargain? Because we hand cut all of our soap we don't always end up with the prettiest looking bars, some are crooked cut some have dings, some are a bit light. 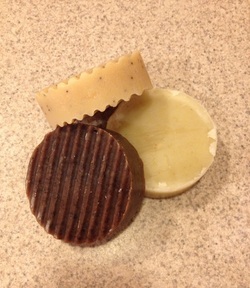 If your not picky about which kind of soap you get or how it looks these bars are for you! These will only be available for a limited time while supplies last! If you would like to use these to make laundry detergent please specify in comments section at checkout so we don't send any bars that contain coffee.